Our neighbor Ove built a big industrial sized smoker recently. 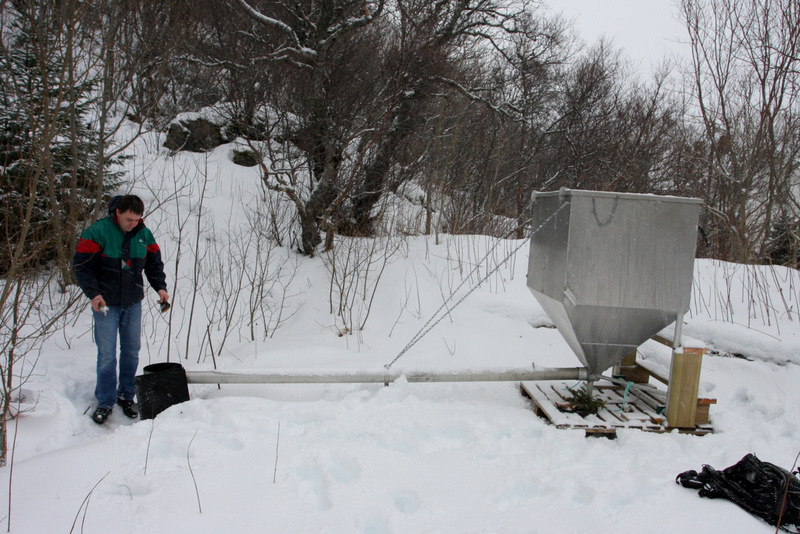 It’s a monstrous beast of a contraption constructed, fittingly, using an old aluminum container for salmon feed. On one end is a stove in which smoke is generated. From there, the smoke goes through a long metal tube to cools down and enters the big container. 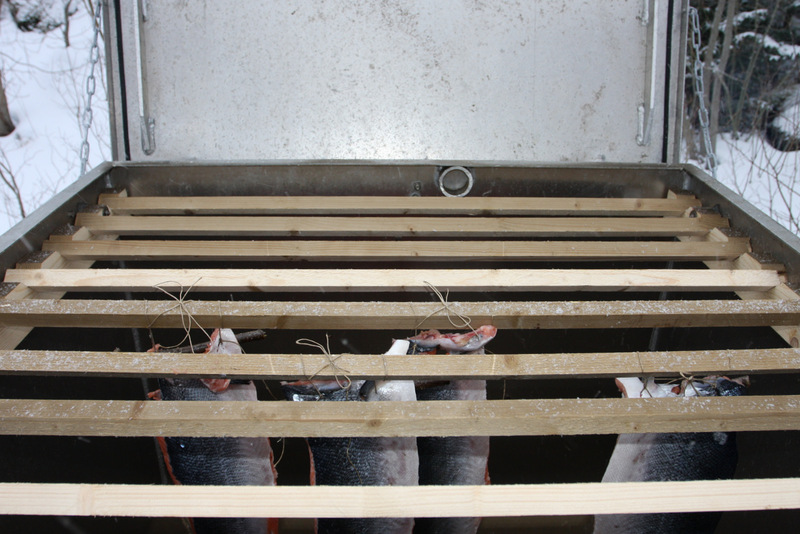 Inside the container there is a row of wooden racks on which fish filets are hung. You can probably smoke 50 filets at a time. The equipment is highly functional; but getting the right formula to produce tasty smoked fish is an exercise in trial-and-error. A couple of months ago I smoked some cod and pollock I caught using juniper needles. The taste was a bit too strong and acidic. 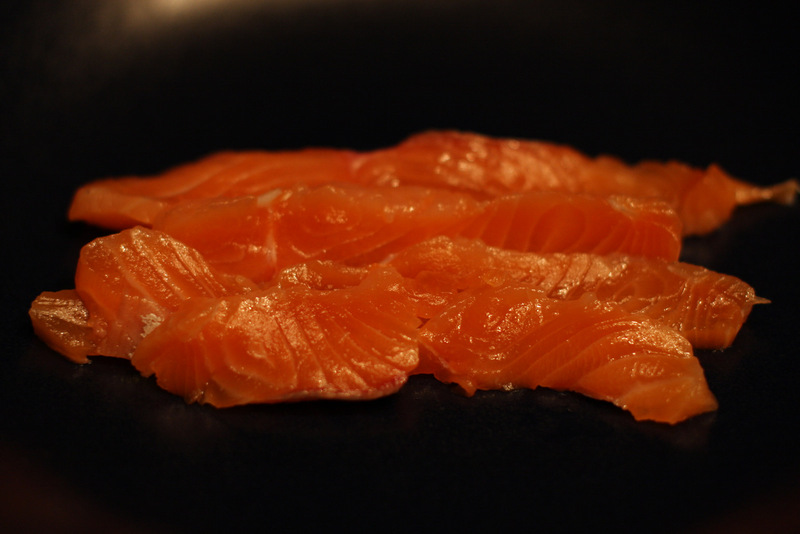 Ove smoked some salmon from the farm he works at. Same thing, although Salmon’s strong flavor could stand up to the strong flavors added by the smoke so it tasted great anyway. Today, with 4 gigantic salmon filets, we were determined to get it right. The filets were marinated in a lot of salt and sugar (2:1 ratio). Just for kicks, we applied cognac on two of the filets. After marinating for 2 full days, they were washed and aired out. It’s important to air dry the surface of the flesh so it becomes shiny, developing what’s called pellicle. Pellicle makes the smoke stick. Last time, we used fresh, green juniper needles. We theorized that the water in the needled made the smoke sour, so Ove made shaving of Juniper wood and dried them in an oven. Smoking is serious business. Today, with snow flurries blowing sideways, we commenced the operation, giving cold smoking a new meaning. On the mark at 10 am, the fish were mounted and fire started. We first started a small fired to make red hot charcoal, but as soon as the juniper shaving was spread on it, a huge fire blazed. That’s not good, because you want smoke, not fire. New technique: a blow torch under the juniper shaving, which made more consistent smoke. Once the container is filled with smoke, the lid was shut. Over the course of the day, we cleared and made fresh smoke with the blow torch 3 more time. Now, four beautiful salmon filets are hanging to dry. They’re supposed to dry to two days, but I couldn’t wait. I went out and hacked off a tail piece and ate it. Just the fish, nothing else. No mustard, dill, lemon, capers… The verdict? It’s sick, sick sick. By far the best smoked fish I’ve ever had. The meat is dense and creamy. The robust juniper smoke is ever present but not overpowering. And none of the slightly fishy flavor of store bought smoked Salmon that you have to cover up with a squeeze of lemon. The deliciousness lingers in the mouth. Never mess with a man with a smoker. Because a man with a smoker is a happy man. Outrageous! Looks good, Winston. I trust you will bring some of your fish-smoking skills back to the US when you return. And it’ll be great fun to build a smoker. Quick question: what made you chose juniper vs. other options? I’ve always heard that juniper is good for smoking Salmon. The flavor is strong. And there’s juniper bushes all over the hill behind our house. I will never read your fish blogs before my dinner time. It makes me craving for food. Hope you ate a lot! Haven’t had great dried smoked salmon since we were at Salmon Falls Resort in Ketchikan Alaska. The owners of the fishing resort made there own smoked salmon. I’m not surprised. The salmon we smoked was marinating in salt and sugar a few hours after it came out of the water. I think that’s important. Salmon has some much fat, and the fat start to change the flavor very quickly without salting. A commercial operation just couldn’t do it that fast. My theory at least.